OUR FLUTTER FEATHER FLAGS unique "Feather" design allows this flag to Flutter even with the slightest breeze. We have 2 types of flags available, Full Sleeve "Windless" type Feather Flag, or Half Sleeve Regular type “Flutter” Flag. We Are USA Seller , Ship From USA Features: Square shape and it is with pizza letter on it. Super bright and can be visible even in daylight. 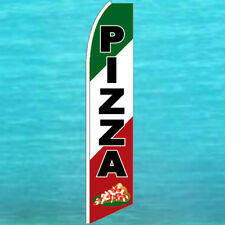 Widely using in pizza store,restaurant and more. Long working time and super durable. On/off switch button to operate. Low energy consumption and super powerful. Perfect to draw in business. Official Papa John's Car Top Sign - manufactured by HTH signs. 3 LED Bulbs. Less than a year old. : 1 Windless (full sleeve) Swooper flag. This flag does not require wind to be open and seen. (This is why we call it a “Windless flag”). This is a single sided flag with the logo or words showing up in reverse on the backside of the flag. WINDLESS (Full Sleeve) Flag. Only Works With Full Sleeve Poles That Fit 3 Ft Wide Windless Flags. PIZZA BY THE SLICE. 3'x11.5' Full Sleeve Flag. Flag Only, Pole/Spike NOT Included. WINDLESS (Full Sleeve) Flag. Only Works With Full Sleeve Poles That Fit 3 Ft Wide Windless Flags. 3'x11.5' Full Sleeve Flag. Flag Only, Pole/Spike NOT Included. 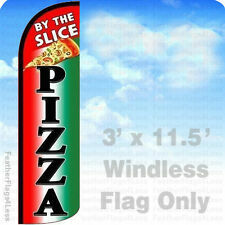 BOLD BEAUTIFUL TALL ADVERTISING SWOOPER BANNER FLAGS. Colors may vary slightly from one printing batch to another. 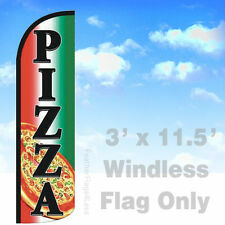 These quality flags are made with 100% shiny knitted polyester for bold vibrant colors. Animated Motion Sign 19" X 10" Ultra Bright. This is not a Neon sing, but BRIGHTER than a neon signs . the blue lights are in motion. They cannot be turned off. New and improve with motion. Safe to touch and operate. WINDLESS (Full Sleeve) Flag. Only Works With Full Sleeve Poles That Fit 2.5 Ft Wide Windless Flags. HOT FRESH PIZZA. 2.5'x11.5' Full Sleeve Flag. Flag Only, Pole/Spike NOT Included. 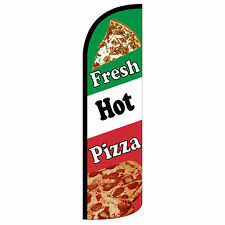 PIZZA BY THE SLICE Coroplast Outdoor SIGN with Stake 12x18 NEW (Red on Yellow) (Printed on one-side). Printed on yellow corrogated plastic material (Coroplast). Printed on yellow coroplast with Red Corogloss Paint. 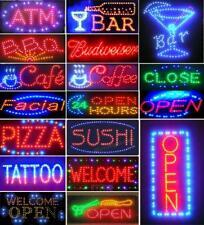 These animated signs are not only attrative in their design, but has much lower energy consumption rate than the similar neonsign products. Animated Motion Sign 19" X 10" Ultra Bright. Brighter than neon signs. WINDLESS (Full Sleeve) Flag 15' ft Tall Kit. PIZZA BY THE SLICE. 11.5' Full Sleeve Flag 15' Pole Ground Spike. Made of highest quality clear acrylic plastic and lighting. AU adapter: Australia. Perfect to display in your bar, pub, club, restaurant, room and anywhere you like. You can choose one color for one sign only.There are blue, green, purple, red, white, yellow and orange. Swooper Flags unique "Feather" design allows this flag to Flutter even with the slightest breeze. Swooper Flag. OUR Swooper Flags are made of aHigh Quality knitted polyester which is made to withstand substantial amount of winds. Swooper Flags Unique "Feather" design allows this flag to Flutter even with the slightest of breeze. Advertising Swooper Flag. OUR Swooper Flags are made of aHigh Quality knitted polyester which is made to withstand substantial amount of winds. There are no magnets on the bottom. Thanks for looking!